For this month’s installment of “Giving Tuesday,” a series designed to highlight travel-themed charities, TPG Contributor Jade Broadus — an avid traveler and owner of two rescue pups herself — shares how one hotel group is taking its pet-friendly policy to a whole new level. Bella relaxing in the lobby. Photo courtesy of Aloft Asheville. There are pet-friendly hotels — and then there’s Aloft Asheville Downtown Hotel, an Asheville, North Carolina, property that’s both a McKibbon Hotel and a member of SPG. Not only does Aloft offer free stays for your four-legged friend, it also includes water and food bowls in each room, doggie goodie bags filled with locally sourced treats and a fenced-in rooftop dog walk. For most guests looking for a pet-friendly option, those generous amenities alone would have them booking the room. But Aloft took it one step further. What started as a simple in-flight conversation between an Aloft employee and a volunteer at a local rescue developed into a one-of-a-kind hotel and dog rescue program that has our wanderlust and pup-loving hearts aflutter. 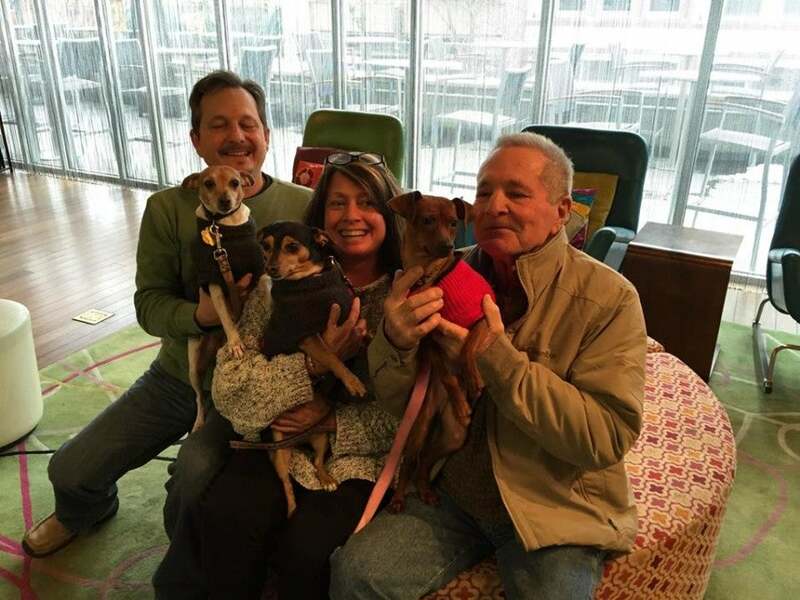 In August 2014, Aloft Asheville partnered with Charlie’s Angels Animal Rescue, a local non-profit animal rescue in North Carolina, to help bring awareness to the rescue itself and to assist in the adoption process by taking in foster dogs as hotel guests. 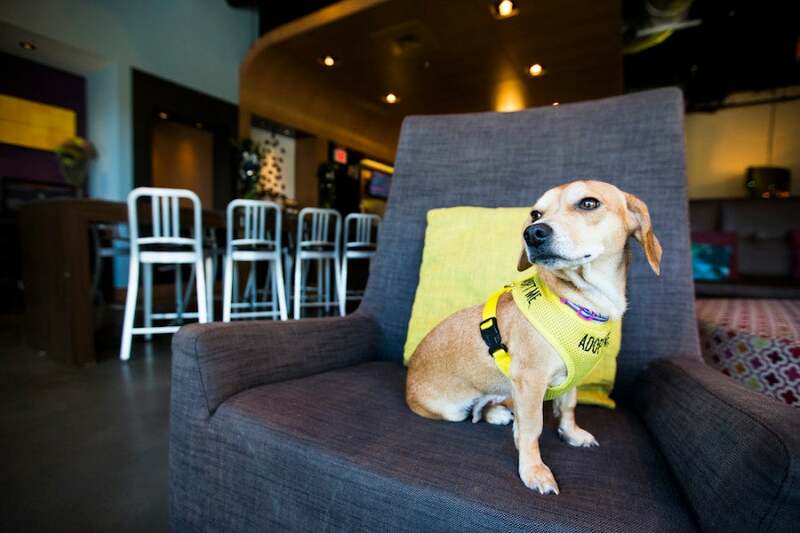 Aloft Asheville takes in one dog at a time, outfitted in a cute “adopt me” vest, and guests are both allowed and encouraged to take the house mascot for a walk or up to the dog-friendly rooftop turf area. Lauren Bowles, a McKibbon Hotel Group manager of the dog-fostering program at Aloft, says that the rescue and hotel go to great lengths to make sure the dog is the right fit for the hotel, since there are many people and dogs coming in and out each day. If a guest expresses interest in the adoptable dog, the hotel and rescue screen and match the dog with the prospective adoptive parent(s). Adopted dog Rusty (in the red shirt) with his new owners. Photo courtesy of Aloft Asheville. Guest response has been overwhelmingly positive, with 25 dogs adopted so far and the 26th making his home at Aloft Asheville this month. And even if an adoptive dog doesn’t go home with a guest, the canine always seems to make its way into a glowing review of the hotel at check-out. While the guests love the dogs, the staff members have been smitten, too; so far two dogs have been adopted by Aloft employees. If you want to see these cute pups for yourself even without booking a stay, the hotel keeps a Facebook fan page with all the dogs that have been adopted. Bubbles up for adoption at The Aloft Hotel in downtown Asheville. Photo courtesy of Aloft Asheville. 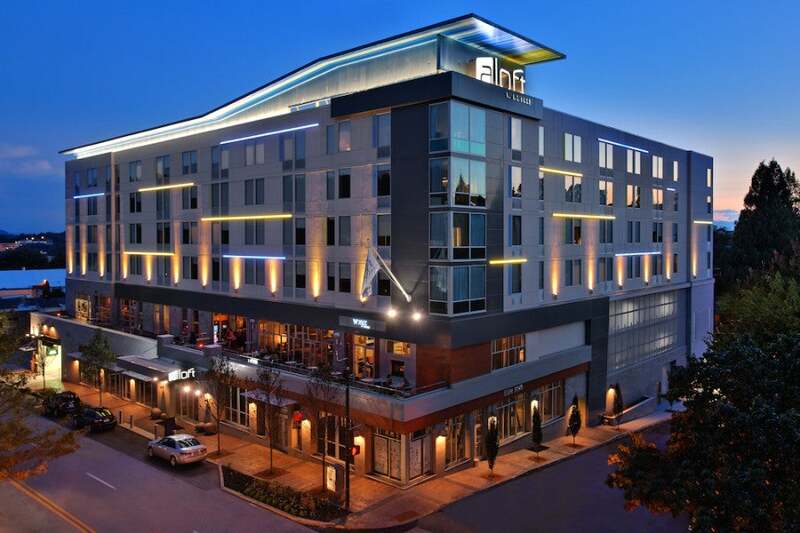 Since the partnership has been so wildly successful, Bowles says Aloft Greenville South Carolina will launch a similar program in November 2015, and plans are set for a seasonal program at the Aloft in Tallahassee, Florida. Do you love this idea and want to help out? Consider donating to Charlie’s Angels Animal Rescue. “Charlie’s Angels are a group of volunteers with a lean budget. Even if you can’t adopt, donations are greatly appreciated,” says Bowles. Do you travel with your pet? What amenities do you love in a pet friendly property? 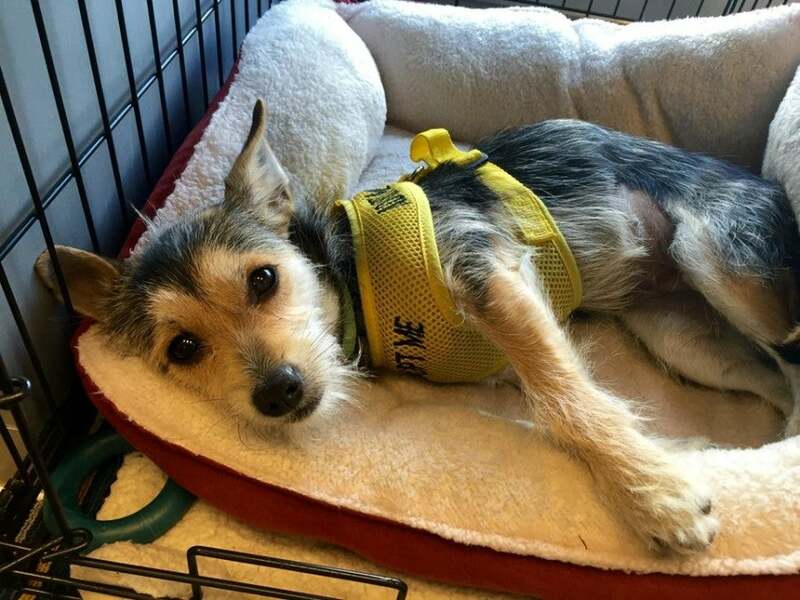 Would you consider adopting a dog at a hotel?